I turned 30 years old this weekend and am happy to say I’m not shying away! I’ve embraced the motto “fruit tastes juicer the longer you let her age on the branch,” and thrilled to be relishing in ripeness. Weeks before the big day I found myself scheming about how I should celebrate my 3-0 milestone. Over the last few years I’ve been shying away from late night bar bonanza’s, finding satisfaction by connecting with friends over good food and drink. This year I opted to think outside of the box, gathering a few pals to celebrate the sweet life. 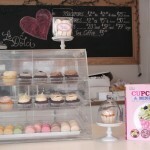 The sun was just beginning to set when I popped open the door at Le Dolci Cupcakes and Cakes on Dundas West. I immediately let out a long, satisfying sigh as a warm waft of chocolate and vanilla spiked aromatics sailed over from the kitchen. Le Dolci is one of Toronto’s most adored sweet shops, perhaps known best for its large workspace where pastry chef’s regularly teach crash courses for curious sweet fans: from glazed doughnuts to crispy croissants, cupcake design to pretty Parisian macarons. I bought my first bread maker in Grade 6 and spent one of my summers in high school working at a resort as a baker producing over 600 loaves a day. I had perfected the pavlova, mastered the muffin and delighted in the therapeutic ritual of kneading dough at a young age. Some might have called me chubby back then but I would have described myself as an enthusiastic pastry professional. By 7pm the room had filled with friends, all of whom were kitchen newbies eager to spend the evening learning a few bakers secrets. When our instructor beckoned us to her classroom we each donned a white apron, clinked glasses of cool Riesling and pulled up our sleeves. That evening our pastry chef cracked open DK Canada’s Cupcakes & Mini Cakes, a brand new offering for those keen on conquering the basics in baking. 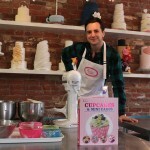 The idiot-proof cookbook features lots of colourful photographs and cupcake recipes with easy step-by-step instructions. While the book largely focuses on honing your cupcake skills (batter and icing prep, piping technique and fondant fun) it also includes plenty of other classic staples in the bakers repertoire such as muffins, croissants, tarts and macarons. The class started with a detailed step-by-step demonstration on how to prepare a classic chiffon (a gentle mixture of batter and meringue) via the Strawberry and Cream Cupcake recipe found on page 92. Once our instructor had prepared the first batch the boys approached the industrial mixer with humorous hesitation. The team worked together to prep a stiff meringue which was then gently folded into the batter, offering a light and fluffy vanilla bean spotted cupcake. Flipping through the first few pages of the book one finds several handy instructions for novice decorators such as how to pipe with a bag and nozzle, filling cupcakes and the 411 on fondant. We put these tips and tricks to good use after preparing a batch of classic buttercream icing (page 98) which we filled into large piping bags. It is here where the fun really got started, as each gent got busy expressing themselves. The team conquered our cupcake challenge by producing edible works of art featuring towers of multicoloured icing topped with floral inspired fondant, sparkling sprinkles and slices of sweet strawberry.